The Indian Point nuclear power plant, the aging facility located 25 miles north of New York City and its 20 million residents, which has been plagued by radioactive leaks, including nine in the last year, will close by 2021. 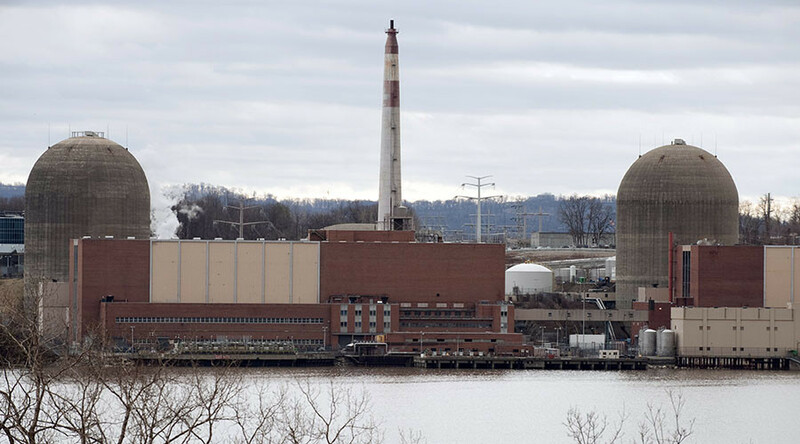 Under the agreement reached by Governor of New York Andrew Cuomo and the plant’s operator, Entergy, two reactors are scheduled to cease operations within four years. “For 15 years, I have been deeply concerned by the continuing safety violations at Indian Point, especially given its location in the largest and most densely populated metropolitan region in the country,” Governor Andrew Cuomo said during his State of the State address on Monday. The plant’s Unit 2 reactor will permanently cease operations no later than April 30, 2020, and the Unit 3 reactor will halt operations no later than April 30, 2021. Spent fuel rods will be transferred from storage pools to ‘dry cask’ storage, and kept on site. The agreement also includes the creation of a $15 million environment and community fund for river restoration and wetland protection. “The agreement provides what we’ve been fighting for for decades: a definite early closing date for Indian Point – our biggest existential threat in the region. It’s a win for the safety for our communities, a win for the Hudson River and all the rich variety of life within it, and a win for a clean, sustainable energy future,” said the president of NGO Riverkeeper, Paul Gallay. Riverkeeper is one of innumerable groups, along with the Indian Point Safe Energy Coalition, that have fought to close the plant because of the frequent issues with the 43-year-old facility, ongoing environmental incidents and the proximity of the plant to New York City. Indian Point’s problems underwent increased scrutiny following the leaks of the Fukushima Daiichi nuclear disaster in Japan, when it was hit by a tsunami following the Tohoku earthquake on March 11, 2011. A study by the Seismological Society of America showed that New York City was at a greater risk from earthquakes than previously thought, and that the Indian Point plant sat nearly on top of a previously unknown active seismic zone. Marilyn Elie, of Indian Point Safe Energy Coalition, who has been fighting for 22 years to close the plant, told RT that despite concerns about safety and security, “it’s money” behind the decision. “Tt just became uneconomical for Entergy to run the plant. My understanding is that they wanted certainty for their stockholders and shareholders, and the future looks very bleak,” said Elie. Elie said one unit was almost kept down for four months over degraded baffle bolts which hold together a structure inside a reactor. She said that was very expensive and the company had no money coming in during that time. Elie said New York State Attorney Eric Schneiderman played a big role in fighting to close the plant. The aging plant has been plagued by problems from the outset. In 1973, five months after Indian Point 2 opened, the plant was shut down when engineers discovered buckling in the steel liner of the concrete dome in which the nuclear reactor is housed, according to the New York Times. In October 1980, 100,000 gallons of Judson River water leaked into the Indian Point 2 containment building from the fan cooling, covering 9ft of the reactor vessel. The flood was discovered when technicians entered the building. Pumps that should have removed the water were found to be inoperative. The Nuclear Regulatory Commission (NRC) proposed a $2.1 million fine for the incident. In February 2000, primary water from Unit 2 leaked into the secondary system through a steam generator, according to the Virtual Nuclear Tourist. In 2005, Entergy workers discovered a small leak in the spent fuel pool. Water containing tritium and strontium-90 was leaking through a crack in the pool building and finding its way to the Hudson River. In 2007, a transformer at Unit 3 caught fire and the NRC raised its level of inspections because the plant had experienced many unplanned shutdowns. In January 2010, the NRC reported an estimated 600,000 gallons of mildly radioactive steam was intentionally vented into the atmosphere after an automatic shutdown of Unit 2. After the vent, one of the valves remained opened for two days, according to the New York Daily News. In November 2010, an explosion occurred in a main transformer at Unit 2, spilling oil into the Hudson River. Entergy agreed to pay a $1.2 million penalty for the transformer explosion. In July 2013, a former supervisor who had worked at the plant for 29 years was arrested for falsifying critical safety records and lying to federal regulators. A transformer failed at Indian Point 3 in May 2015, causing the automated shutdown of Reactor 3. A fire that resulted from the failure was extinguished. The failed transformer contained about 24,000 gallons of dielectric fluid, and 3,000 gallons are estimated to have leaked into the Hudson River, according to Entergy. In June 2015, a mylar balloon floated into a switchyard, causing an electrical problem and the shutdown of Reactor 3. In July 2015, Reactor 3 was shut down again after a water pump failure, and in December 2015, Reactor 2 was shut down after several control rods lost power. The original 40-year operating licenses for Units 2 and 3 expired in September 2013 and December 2015, but Entergy applied for extensions which the NRC was considering granting for a 20-year period before the latest agreement was reached.